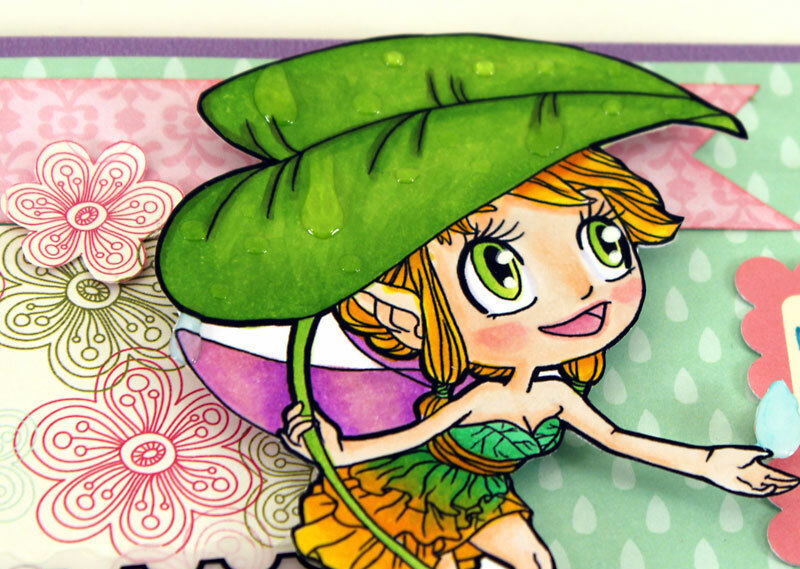 Leah's Crafty Life: Brella Fairy in the house! Day 2 of the Some Odd Girl brand new digital release, and today you get to meet Brella Fairy. With that leaf she's ready for Spring showers or those hot Summery days when the sun is beating down so harshly. I imagined her after a heavy rain, with the sun peeking through in the afternoon. I used glossy accents on her leaf and let them dry, I thought it added such a sweet detail to an already sweet image. Check out her little toenails! So cute. Hop on over to SOG Blog to check out the other ways my fellow oddies colored Brella Fairy up. Some Odd Girl is also going to be hosting Fan Friday, so please share your work on the Some Odd Girl facebook page to have a chance at your work being spotlighted on Friday! Leah your card is so beautiful...I love how you colored her dress two colors...and those beautiful wings...I totally love it..
Beautiful! I love the 2 colored dress and raindrops also!! I am TOTALLY in awe of those gorgeous droplets Leah!! Such an amazing idea!!! The colors are amazing as well!! This is just soooo precious! That glossy accent raindrops are so realistic. I love it!